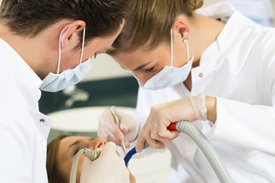 Smiles Are Us understands that tooth extractions often come with great hesitation and nerves. Our knowledgeable dentists are trained to make your experience comfortable and effective. Prior to pulling the tooth, you will be given an injection of local anesthetic to numb the area where the removal will occur. For more complex cases, a strong general anesthetic might be used to make you sleep through the procedure and ward of pain from traveling throughout your body. When it comes time to extract the tooth, your dentist will cut away any excess gum and bone tissue and proceed with forceps to grasp the tooth and pull it out of position. Need a tooth extraction? Contact our practice to learn more about your options today.